As far as I know, Mormons are not protesting this answer – even though it is no more accurate than the initial one quoted above. The problem with the new and improved answer is that the doctrines and practices of the Mormon Church are not based on the Book of Mormon. Mormonism says that there was a time when God the Father was not God, but was a mortal man moving toward godhood. Mormonism says God the Father, in His current exalted state, has a body of flesh and bone. Mormonism says that the God we human beings know is not the only God; He is one of many true Gods (but the only one we need to deal with). Mormonism says that God the Father is the literal offspring of another God (who was the offspring of yet another God, etc.). None of these foundational LDS teachings on the nature of God is found in the Book of Mormon. In fact, the Book of Mormon teaches that God has always been God, that God is a spirit being, and that there is only one true God. Mormonism’s doctrines on God are not based on the Book of Mormon. Mormonism says that temple participation is essential to attaining exaltation. Mormonism says vicarious baptism for the dead is necessary for those who died without the benefit of LDS baptism. Mormonism places great significance in granting all worthy males the Aaronic and Melchizedek priesthoods. Mormonism says God disapproves of people drinking coffee and tea. Mormonism says that God wants people to continually wear protective “garments of the Holy Priesthood” which are given to them in Mormon temples. None of these basic LDS practices are found in the Book of Mormon – the book is silent on all of these things. Many of Mormonism’s key practices, therefore, are not based on the Book of Mormon. So to say Mormonism is “The doctrines and practices of the Mormon church based on the Book of Mormon” is incorrect. But Mormonism is a complex system, difficult to define in a sentence or two. On MRM’s A-Z webpage we avoid defining Mormonism and stick with merely identifying it: The religion of The Church of Jesus Christ of Latter-day Saints. Of course, we devote most of the rest of the website to providing defining details of what comprises this religion. Mormonism: A pseudo-Christian religion founded by Joseph Smith in 1830 and continually modified by successive Mormon leaders. Asserting that the Bible was corrupted and all of Christianity apostatized following the deaths of the biblical apostles, Mormonism’s teachings deviate significantly from the central doctrines of biblical Christianity. There’s probably not one accurate definition that would make everyone happy, but why don’t you give it a shot? What short, defining answer to “What is Mormonism?” would make you happy? This entry was posted in Authority and Doctrine, Baptism for the Dead, Book of Mormon, God the Father, Great Apostasy, LDS Church, Misconceptions, Mormon Temple, Nature of God and tagged Apostasy, Baptism for the Dead, Book of Mormon, Church of Jesus Christ of Latter-day Saints, Garments, LDS Church, Mormon Church, Mormonism, Nature of God, Priesthood, Temples, Word of Wisdom. Bookmark the permalink. 14 Responses to What is Mormonism? Perhaps what we should do is ask the 100 or so various sects of Mormonism, what exactly Mormonism is. I always find it fascinating that LDS folks in particular, in this day-and-age, really don’t like to bring out all the peculiar teachings of their religion. They cloak it all in a secretive silence excusing their nuancing with the idea that people just won’t understand. I always say that it isn’t that we don’t understand Mormonism, we don’t believe it. Mormons mix these two things up. I understand what they are claiming. It’s not that complex. Early on when Smith and his buddies were in their full free flow of consciousness, they’d brag about their differences from normative Christianity. Even Bruce McConkie who wrote the book on Mormon doctrine for the LDS church wasn’t shy about proclaiming the oddness of the sect’s beliefs. The new group of leaders however, are into trying to make the LDS religion sound like normative Christianity. I always like to link to this comparison of three of the Mormon sects regarding what they believe. It’s a handy little chart. Just a warning. The site linked to above has some things that are more than off the bubble but the chart is a good one. Utah , and is offically titled The Church of Jesus Christ of Latter Day Saints . Mormonism is a religion founded by Joseph Smith, Jr. in 1830. It is the belief in eternal human potential. The goal of life is to be happy, and happiness is achieved through self-improvement. In all honesty Mormons can never “Define” Mormonism. It keeps changing and “evolving” as it were. Mormon prophets contradict former prophets and presidents and cannot agree, and even the average LDS cannot agree with other average LDS members. We have seen that happen here on the blog many times over the years. [ Mormon Doctrine p 513 ] . us would come on the scene in the latter days — Matt 24 : 11 .
a substitution — i.e. only an imitation . apostles , and sadly have been fooled into joining their man made religious organization . I remember time and again that we’d have Mormon posters show up here and specifically charge Rick and I that we didn’t know what we were talking about regarding Mormonism. When asked to provide information that contradicted what we were saying they would go silent. They couldn’t refute what we were saying because we documented it from Mormon sources. It’s pretty hard to argue against the LDS/FLDS belief that they will become gods, procreate spirit children with their goddess wives, and rule their own planets. As it turns out, they just didn’t like us saying it. Cattyjane wrote that when she first showed up here she thought we were all pretty halarious. Then she started to research what we were saying here and guess what? She left the LDS church. There are Mormons who seem to be practicing their own form of Mormonism. They put the lie to the idea that if you want to know about Mormonism, ask a Mormon! their have been a few mormons here over the years that have been true blue mormons who would debate us, tell us were wrog, then later come back claiming to have left the Church and followed Jesus becasue of what we shared. Praise God that they come to the truth. Mormonism is what Mormons want it to be, as it suits them. More specifically, or generally, depending on how you wish to view it: Mormonism is the religion developed from Joseph Smith that is based around his book the Book of Mormon, which has developed and changed through continuing revelation since 1830. Mormonism is a religion wherein eternal progression is espoused, as is full loyalty to the authority of the Church organization. claimed to be exclusively appointed by Jesus to represent Him and offer His gospel of salvation . have partook of communion and have been baptized are said to be deceived . I was thinking about your comment and the Book of Mormon. What is interesting, is that while the Bible has its detractors, there is a broad spectrum of scholars, archaeologists and historians who take it seriously, in those different areas. It is based on historical facts, and verifiably so. On the other hand, there is no one outside of Mormonism who espouses the Book of Mormon. It fails on every point of comparison. It is the invention of Joseph Smith, first as a deception to give his peeping powers credence, then as a “religious” work, when he realized that he had no real future as a peeker. Smith’s transition from peeker to “prophet” tells us all we need to know about Mormonism and the Book of Mormon with its anachronisms and plagiarisms and all of the falsehood and contradictions that go along with it, by Smith and his “witnesses”, who couldn’t get any of their stories straight. Dan Vogel has posted a new video about this here. There is enough documented evidence of this that it upsets the Mormon Hierarchy, but they still hide behind anonymous essays to try and answer the real facts because they know that if they tie their names to them, they will be shown to be as dishonest and misleading as the essays are. They take responsibility for nothing. They simply keep living off of the Corporation and pass it on to their relatives and other “insiders” that will support the nepotism that has been prevalent in the Church since the days of Smith. Smith planned on building a family dynasty. So did Brigham Young and others. To a large extent, they succeeded. This is not “all are alike unto God”, but all are alike if you are related to us. The current “prophet”, Thomas Monson, was paid by and worked for the Church his entire life, an institutional Mormon. He has gotten very wealthy from that. He has three places of residence. It is not the last shall be first and the first shall be last with these men. They are ALWAYS first, always get the breaks, and always get the benefits. This is not a religion, but a Corporation masked as one, with one object, to get richer and benefit those at the top of the food chain. Grindael, you highlight two of the important points I hoped to convey: a) the religion is made up, as it is based on the fictional work of the the Book of Mormon and b) the developing system claiming to follow the religion is more akin to a corporation than it is to anything else. The BoM (Book of Mormon) was and is the hook to get people involved in Mormonism to begin with. But once in, it appears the BoM is largely fluff. Yes, it is read from, and adherents are given daily instruction from it, but the meat of the doctrine and practices do not come from it. Where the meat comes from are other sources deemed official and binding by the leaders of the organization. These leaders are supposedly with minimal fault, if any at all, at least while serving. They represent current God made choices as to who should lead his church, and are therefore venerated beyond reproach. The rationale appears to be that God would not pick people who are too flawed to lead his church, or something much like that. Once out, though, the person and his teachings become increasingly thrown to the wolves. The one thing (two?) that cannot ever be criticized, though, is the church, and Smith, from whom the church developed. This is why current leaders cannot be criticized: they are seen as being the church, and the church cannot be wrong. You mention the anonymous essays offered to answer facts. I believe this is a change in tactics to, in part, combat the possibility of later calling out individual leaders and insulate them by the veil of the authority of the church. You state it such that they will be shown to be dishonest. Indeed, and the church itself cannot be dishonest. So, Mormonism is a carefully crafted organization designed to be malleable and immune from criticism. Its genesis from a fictional work invariably leads to fictional doctrines in the future. To hide these fictions, it must be able to alter its message on cue to avoid addressing the fictions head on. So, in many ways, Mormonism becomes what it needs to be whenever it suits them in a given moment. Perhaps one of the many ways to define this word is to look at its etymology. 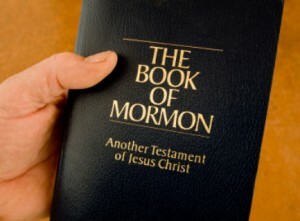 Mormon | Origin 1830: from English more, from Reformed Egyptian mon ‘good’. A contraction of the two yields Mormon. Lit. more good. Recently I spoke with two LDS missionaries. They said something interesting. “I believe”, despite their opinions being the direct opposite of a long line of Prophets and Presidents of the LDS faith. Mormonism is the freedom to believe in an ‘apostate’ doctrine and still be a member of the LDS faith. What I want to know is if a person gets to the Celestial Kingdom based on what they believe or based on whether or not they are a member of the LDS church. My understanding is that “after all you can do” is balanced out by folks being able to get the work done in the “next world” in order to achieve deification. The fun part of the religion with its founders was the endless blue sky speculation and creative teachings and doctrines. Remember, the very early bunch was into some pretty strange stuff including folk magic. Based on their use of second sight vision, they could conjure up all manner of spirit beings. Note how Smith reported the restoration of the priesthood. This was part of the creative nature of Smith since he restored something that wasn’t even part of the primitive Christian Church.